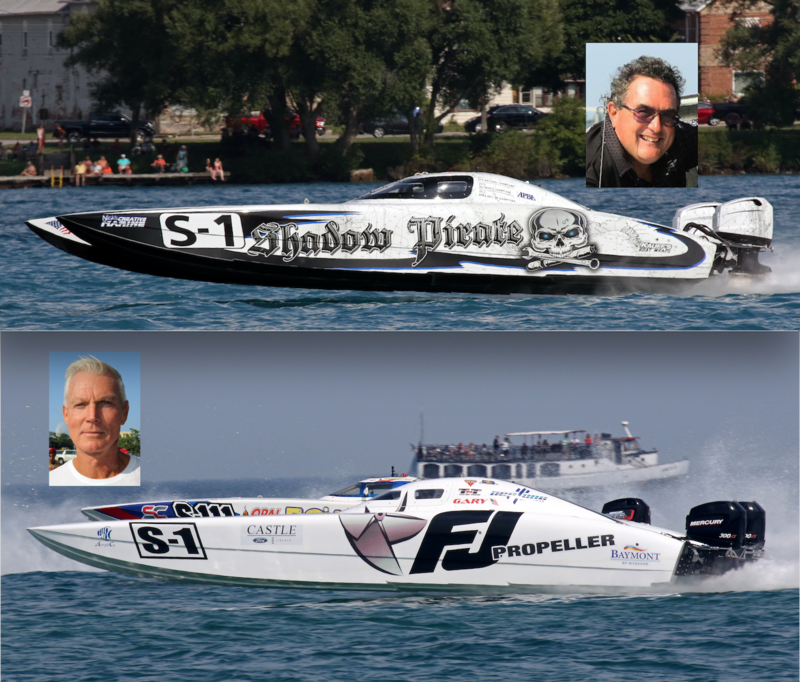 Superboat Stock competitors Nick Scafidi of Shadow Pirate and Gary Ballough of FJ Propeller. Nick Scafidi, who bested the Super Boat International competition one year ago to take the Key West World Championship title in Superboat Stock class, is gearing up to defend his title in next week’s 2018 races. Speaking to Powerboat Nation as an exhibitor at this week’s Fort Lauderdale International Boat Show, Scafidi expressed enthusiasm about history repeating itself—particularly with former Miss Geico champion Marc Granet sitting next to him in the cockpit of the 32′ Doug Wright hull. But despite his success on and off the race course, competition has been bittersweet. Scafidi laments about being accused of having an unfair advantage in Shadow Pirate—about being bullied into doing some “major surgery” on the Doug Wright hull’s setup after some of his competitors griped about his use of a jackplate on the hull. He says this was part of the initial setup that his friend and former race-boat partner Scott Porta (owner of Porta Products Corporation in New Smyrna Beach, FL) helped him perform a few years ago. “Scott makes jackplates and other high-performance items that go in lot of the boats,” Scafidi explains. “He assisted me in some of the setup and raced with me for a while, and he had jackplates on his own boat (Porta Products) in 2014-15. Lee Austin (in the 30’ LA Marine catamaran Specialty Marine Center) had run jackplates on and off. Nowhere in the rule books does it say you can or can’t have jackplates.” Indeed, according to Scafidi, offshore racing sanctioning bodies SBI and OPA had approved of jackplates for years. But as soon as Shadow Pirate started winning races, some of the competitors in his class got sore and accused him of having an unfair advantage, he says. While it may be true that the SBI rule book is vague about the use of jackplates, Scafidi’s on-water competitor and multi-World Champion Gary Ballough of FJ Propeller fame defends his role in ensuring that all of the boats running in Superboat Stock class compete fairly and equally—and without a jackplate’s manual manipulation of the engine. The SBI World Championships roar into Key West Nov. 4-11.